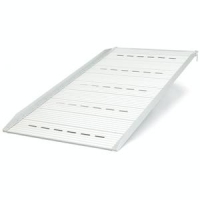 The Pride Solid Ramp is a great option for doors, curbs, and even stairs. It comes in a wide variety of lengths from 1.5'-5'. You can choose between a grip tape surface or an aluminum option with slots to drain water. 2' 11 lbs 600lbs 29"
3' 16 lbs 600lbs 29"
4' 22 lbs 600lbs 29"
5' 28 lbs 600lbs 29"
6' 35 lbs 600lbs 29"